In ear. Noise cancelling. Better sound. Shut out the world and lose yourself in your music—or let the world in. 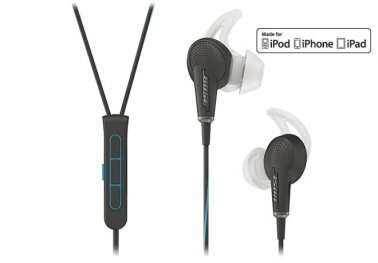 It’s your choice with the first in-ear noise cancelling headphones from Bose. The QuietComfort® 20 Acoustic Noise Cancelling headphones let you enjoy better sound every day, everywhere you go. Turn on noise cancelling to reduce surrounding distractions and focus on your music. Or, at the touch of a button, activate Aware mode to hear what’s happening around you. Proprietary StayHear®+ tips provide a soft, secure fit. The inline microphone and remote let you switch easily to calls and control of certain functions. Choose either the QC®20 Apple device model or the QC®20 Samsung and Android™ model to use with your respective device. QC®20 headphones let you experience music on the go as never before. You'll enjoy lifelike, digital sound quality that stands out from the noise around you—plus the freedom of an in-ear headphone. StayHear®+ tips physically block some noise while our Acoustic Noise Cancelling technology electronically reduces most of what's left. It's just you and your music, even in noisy environments. Controls are all at your fingertips. Use the slider switch on the control module to turn noise cancelling on and off. The inline microphone/remote houses Aware mode and call answer/end buttons. The 4-button remote, provides volume and music control plus access to voice-recognition apps, like Siri® or Google search.